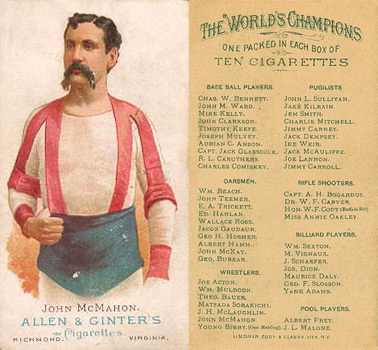 06-1866: By this date John McMahon had recorded 39 wins with no losses and some of his wins came over: Al Store, Uxile Crickett, Lon Doolin, Jim Craven, George Stone, Ed Fox, E.M. Titus, W.M. Scoville, John Harrod, Cpt. John Haley, Homer Lane, Parry Higby, Albert Ellis, J. Dunlap, and George Van Dyke.